Five months after Rotherham-based manufacturing specialist, MTL Group went into a shock administration, the business is showing strong signs of recovery having been secured by a partnership deal with WEC Group. MTL Group was one of Europe's fastest growing project manufacturing specialists in the metal sector and a global exporter of secondary steelwork. It works with a global blue-chip customer base in the defence, construction equipment, rail and off-shore wind energy sectors. John Sumpton and Hunter Kelly of EY's Restructuring team were appointed earlier this year as joint administrators at the Brinsworth firm. The Lancashire-based WEC Group, which comprises 14 companies specialising in welding and fabrication, brought the company out of administration, saving 135 jobs. MTL has now traded profitably in each of the three months following that deal, compared to month on month losses in the previous 12 months. The company has also won back a £3m defence contract which it lost when it went into administration in February. Wayne Wild, commercial director of WEC Group, said: "We have really hit the ground running, and as a result we have seen some positive and encouraging results. "MTL Advanced is continuing to move forward in the right direction, thanks to the hard work and commitment of all the team there. "We were delighted to win back the major order that had gone away following administration and the investment programme we have announced will make MTL an even stronger operation. "The new apprenticeship scheme will see MTL Advanced train and develop young skilled workers in the South Yorkshire area, giving them the tools they need to help us drive the business forward. It is a real investment in the future and we're currently looking for our first intake of six apprentices. 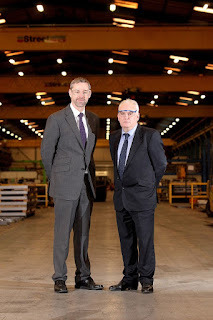 "The £1m investment programme will see the installation of a new large bed laser cutting machine and a wet painting line at the Rotherham factory to enhance the services that MTL can deliver. "And we're also looking to recruit in certain areas as we work in partnership with MTL on its continued development. It's all very positive for the future." Karl Stewart, sales director of MTL Advanced (pictured, left), added: "The order book of MTL is much better than planned and this has resulted in recruiting nine new employees over the last three months. "The synergy with WEC Group is already proving to be very strong. The deal has enhanced our capabilities and capacity and that is a major advantage to all our customers. WEC Group has forecast a turnover of up to £60m this year.